Mozilla is continuing to fight for net neutrality — in the courts, alongside Americans, on Twitter and, today, by joining the Red Alert protest. The Red Alert protest raises awareness about net neutrality’s importance, and the means for keeping it intact: In mid-May, the Senate will vote on a Congressional Review Act (CRA) resolution to overturn the FCC’s net neutrality repeal. We’re partnering with organizations like Consumer Reports, the Electronic Frontier Foundation, and Reddit to encourage Americans to call Congress in support of net neutrality. To get involved: Call your members of Congress and express your support for net neutrality. Last month, Mozilla published results from a nationwide poll that reveals where Americans stand on net neutrality. The survey reinforces what grassroots action has already demonstrated: Americans support equal access. 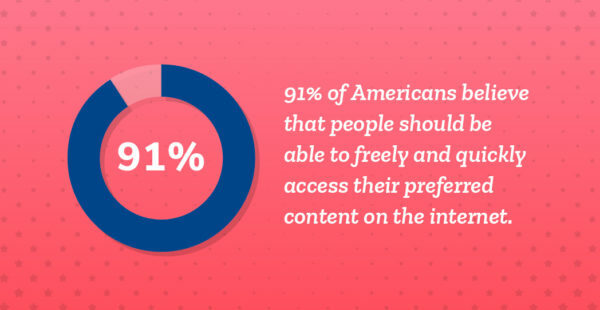 91% of Americans believe consumers should be able to freely and quickly access their preferred content on the internet. Only 9% of Americans think ISPs should be able to offer fast lanes with quicker load times. Support for net neutrality is growing: When Mozilla and Ipsos asked this same question in 2017, 86% of Americans believed the former. 78% of Americans believe equal access to the internet is a right. This opinion is most common among younger Americans (84% of adults under the age of 35). 76% of Americans believe internet service providers (ISPs) should treat all consumer data the same, and not speed up or slow down specific content. This opinion is most common among older Americans (80% of adults ages 55+) and Americans with a college degree (81%). 63% of Americans do not think that ISPs will voluntarily look out for consumers’ best interests, compared to 32% who agree with this statement. Faith in ISPs in declining: When Mozilla and Ipsos asked this same question in 2017, 37% of Americans trusted ISPs. See the full results from our poll here.